This 11-day tour will ensure an enchanting view, as you watch the sunset on the Ganges and experience the awe of the Taj Mahal. You can get lost in the pink city of Jaipur or barter for rare items at Tordi Garh. For your first day of the tour you will set off on the city’s modern metro system to take a walking tour around Old Delhi, then board an overnight train for Varanasi. In the morning you will take a peaceful boat ride down the Ganges to watch the sun rise, witness the traditional life and death rituals taking place along the riverbank as people pray in the water. While this trip is structured you still have plenty of free time to go exploring yourself if that is what you wish to do. Included in the trip is a drive through the idyllic countryside of Tordi Garh, an exclusive village where not many travellers pass through. Explore the old temple and the markets and stay in heritage accommodation, which was once a palace for the town’s nobility! This tour is focused around sightseeing and a is cultural experience. There are not many leisure activities included, bar the hot air balloon ride, therefore it is not the right tour for you. However, if a peaceful, all-inclusive trip to see authentic Indian culture is what you are looking for then this a brilliant option. While the name of this tour suggests a safari, it is actually very well-rounded. You not only get to witness the majestic tigers of Ranthambore National Park, you can also explore the ancient tombs and mosques of New Delhi, visit the Taj mahal, and so much more. The tour begins in Agra where you will visit the ghostly city of Fatehpur Sikri before travelling on to Karauli to stay at the Palace Bhanwar Vilas. The next leg of the trip offers a nice contrast to most of the other tours out there as you make a visit to the children and teachers at a local school where the tour company operates a programme called ‘Change for Children’. The pink city of Jaipur is the next stop with demonstrations of fabric dyeing and block printing with an optional balloon ride over the city! Overall, this tour is standard in its display of Indian culture but is still highly rated and recommended. If you are looking for a crash course in Indian society then this is definitely worth considering. This tour exudes adventure with a more active way to explore India. This trip is definitely more relaxed and peaceful as it includes a trip to Rikishesh, the yoga capital of the world, and sights of the Himalayas. However, it still includes excursions to the bustling capital of New Delhi, you might say this tour has the perfect balance. Some of the experiences on this tour include a sleep under the stars at a nearby jungle, take a stroll along the river Ganges, or perhaps seek a little enlightenment from the yoga capital. Deeply rooted in history is the Jallianwala Bagh, the site of the tragic 1919 massacre that played a vital role in India’s independence. There is much history to experience on this tour, such as a visit to the world heritage listed Humayun’s Tomb, or the Red Fort. You can even try your luck at haggling in the city’s bazaars and sample spicy street food along the way. 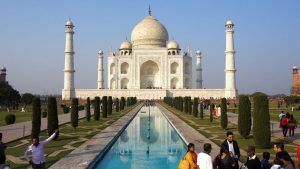 Check out this tour if you have an interest in finding out about India’s devastating history, but also to see how it’s cultural traditions still hold strong today despite the many years of struggle. For a literal taste of India make sure you check out this food adventure. Indulge in the puri bhaji of Delhi, much on divine kambori at Amber Fort, and even learn Rajasthani cooking techniques! Head to Delhi’s oldest mosque to explore their most prominent religion, Hinduism. You will meet a passionate cook in Agra, who’s dishes embody the Mughlai cuisine, reflective of cooking styles and recipes from Central Asia and North India. Try not to sneeze as you take a trip to Khari Baoli, Asia’s largest wholesale spice market. This tour includes an expert local guide and has so much to offer. Each day delves into a different culinary practice and cuisine, learn the history behind the meals and enjoy the amazing flavours of India.